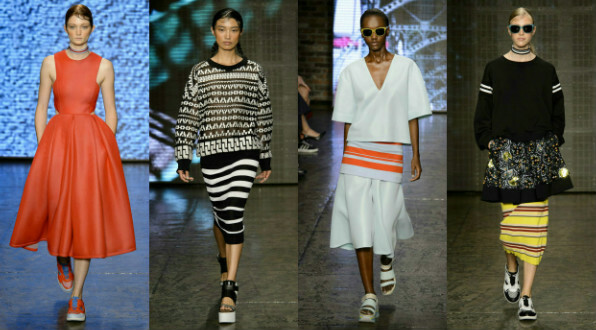 DKNY’s Spring 2015 collection was full of vibrant prints and colors, all combined into figure-flattering silhouettes with a sporty vibe. For a girl whose closet is full of neutrals, this collection definitely caught my eye and left me wanting quite a few of these looks! The bright oranges and reds were contrasted with pastels, which were in turn contrasted with several neutral outfits. Sporty seemed to be the underlying theme in all of the looks; even skirts, peplum tops, and fit-and-flare midi dresses were paired with sneakers and sporty sandals. When I first laid my eyes on this look, I was surprised at how much I loved it. While I prefer neutrals, every once in a while an unexpected color combo catches my eye and makes me fall in love. The navy and orange color palette is unique and playful, and this outfit is perfect for a day of classes. 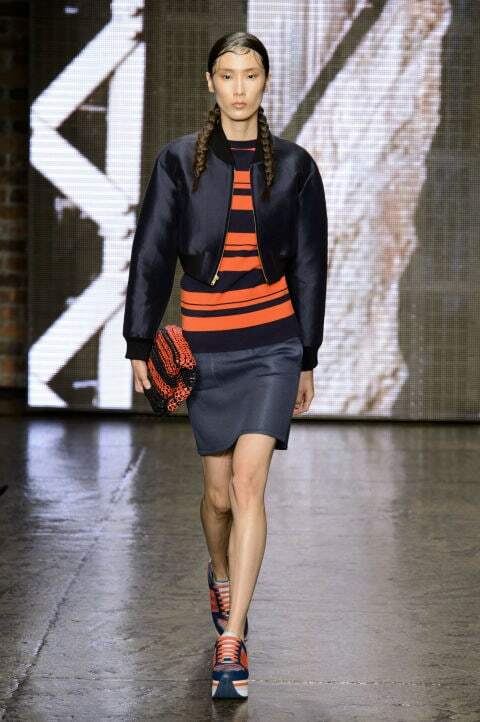 To recreate the above look, pair a navy-and-orange striped top with a fitted, navy skirt. Slip on a sporty bomber jacket and a pair of navy sneakers. Add a dash of sophistication to an otherwise casual outfit with a bold orange clutch. This was my favorite outfit on the runway, and it perfectly mixes flirty and sporty styles. 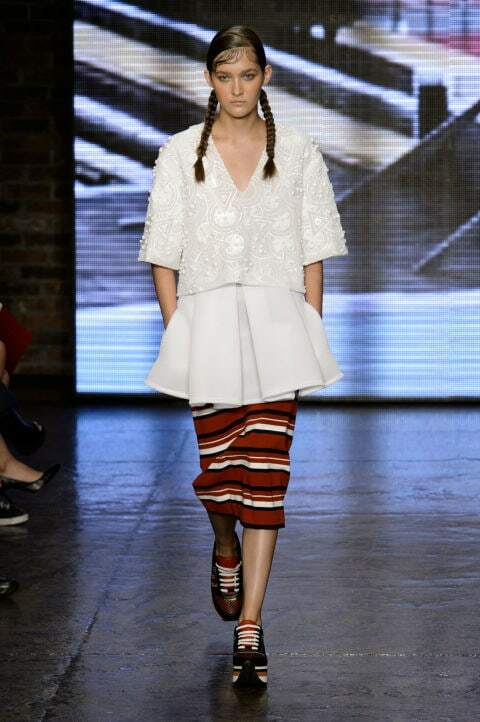 The pearl and peplum detailing on the top balances out the stripes and sneakers, while the reoccurring braided pigtails add a playful yet sleek vibe. Begin by choosing a navy, white, and red striped skirt. Combine it with a white peplum top and navy-and-white sneakers. Add a layered, pearl necklace in lieu of DKNY’s sewn-on pearl detailing. To finish the look, swipe on a bit of bronzer and black eyeliner to channel the model’s fresh-faced makeup. In the past, I’ve experimented and failed with pastels; I just can’t seem to pull them off, and occasionally get a bit jealous of those who can. This “grass is greener on the other side” mentality definitely left me drooling over this last look; the color palette is 100% spring-ready. For a similar outfit, pair a light blue skirt with a pale yellow top. 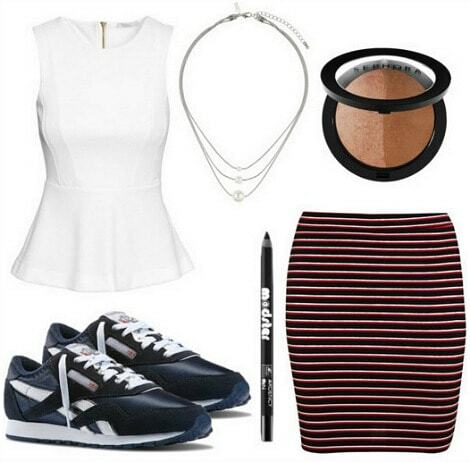 Get inspired by the original outfit by incorporating the majority of the stripes in accessories rather than clothes. You can do this by stacking on colorful bracelets in pastel hues. Choose strappy, platform sandals and get sleek hair like the model with the help of a smoothing serum. What did you think of this collection? Are you digging it? Which of these looks is your favorite? Would you wear any of them? Remember to let me know your thoughts in the comments below, along with any designers you’d like to see in upcoming weeks!